Laura Nyro had missed her intended flight from New York to London, forcing her to take a plane that arrived at six o’clock in the morning. Now here she was, barely 12 hours later, warming up before recording a performance before an invited audience in a small auditorium at the BBC’s Television Centre, for a series called In Concert. This was in May 1971, three months after she had made her British debut at the Royal Festival Hall, giving a solo concert in which the first set was performed by her then boyfriend, Jackson Browne, who was also appearing in the UK for the first time. It had been a wonderful recital: she started with “Stoney End”, included “Timer”, “Been on a Train”, “Emmie”, “Map to the Treasure” and “Christmas in My Soul”, read a poem called “Coal Truck”, and finished with a lovely medley of “He’s Sure the Boy I Love” and “Spanish Harlem”. Such range, such composure, such deep connection with her audience seemed exceptional in one who was still only 23 years old. She readied herself for the BBC’s cameras in a voluptuously flowing mauve and lilac dress with lace half-sleeves: a typically dramatic costume. As she sat at the piano, I was struck by the way that she could turn her head to look like at one moment like a exquisitely soulful contessa from a Velasquez painting and at the next like a lusty young maid from one of Chaucer’s tales. As well as her manager of the time, Richard Chiaro, there was a new boyfriend along for the ride. “You’ve got to sit somewhere I can see you,” she told him. But a few minutes later she was scolding him for singing along while she ran through some of her numbers. In such an intimate setting, the evening was unforgettable: opening with a medley in which “Ain’t Nothing Like the Real Thing” sandwiched “Natural Woman”, she sang “Buy and Sell”, “Stoned Soul Picnic”, the then-unrecorded “I Am the Blues”, “Christmas in My Soul”, a medley of “Timer”, “Ooo Child” and “Up on the Roof”, and “Mother Earth”; she delivered “Stoney End” as an encore. It was transmitted on BBC2, but in the intervening years it seems to have vanished. Long ago I asked Alan Yentob, a senior arts person at the corporation, to see if he could unearth it, but there was no trace. It was 23 years later, in November 1994, that Laura made her final British appearance, accompanied by her three backing singers in the ideal 19th century Gothic environment of the Union Chapel in Islington. The set finished with her lovely version of “Walk on By”. And then she was gone, to be carried away by ovarian cancer in 1997 at the age of 49. She remains a powerful and enduring presence among those who fell under the spell of her extraordinary talent. One of those fans is Billy Childs, an American jazz pianist — known for his work with Freddie Hubbard and Dianne Reeves, among others — who has just released an album called Map to the Treasure, on Sony’s Masterworks label, in which his arrangements of 10 Nyro songs are delivered by different singers. It’s a risky undertaking. Nyro’s first success came with other people’s versions of her songs (the Fifth Dimension’s “Stoned Soul Picnic” and “Wedding Bell Blues”, Blood Sweat & Tears’ “And When I Die”, Barbra Streisand’s “Stoney End”, Three Dog Night’s “Eli’s Coming”), but it didn’t take long for her listeners to realise that the composer’s own versions far outstripped those of her interpreters. Nyro’s full-strength personality suffused her writing, as became apparent in her two masterpiece albums, Eli and the Thirteenth Confession (1968) and New York Tendaberry (1969), and their successors. Only she could properly explore the duality of the Madonna/streetchild persona (which she encouraged through her choice of jacket photos for those two albums). So to attempt cover versions at this stage of the game might seem otiose. Who, after all, can add anything new to such cherished pieces as “The Confession” and “Upstairs by a Chinese Lamp”? Amazingly, Childs manages it — not by attempting to match or emulate the raw, romantic power of the originals, but by looking for facets of the songs to which he can apply his considerable resources, and by recruiting a group of singers who do not set out to sound like Nyro but bring their own voices, along with an unmistakeable admiration for the source of the material. A string quartet appears on every track, with guests soloists featured alongside the singers: Wayne Shorter’s soprano saxophone with Esperanza Spalding on “Upstairs by a Chinese Lamp”, Chris Botti’s trumpet with Shawn Colvin on “Save the Country”, Steve Wilson’s alto saxophone with Susan Tedeschi on “Gibsom Street”, and Jerry Douglas’s dobro with Alison Krauss on “And When I Die”. Childs is the pianist throughout, supported by the impeccable rhythm team of Scott Colley (double bass) and Brian Blade (drums). Childs jumps in straight at the deep end by opening the album with “New York Tendaberry”, one of Nyro’s most personal songs, delivered by the operatic soprano Renée Fleming and the cellist Yo Yo Ma. So right away you know we’re not in for a set of mere recreations. The beauty of Fleming’s tone and the sensitive formality of her phrasing takes the piece away from Nyro’s uptown-soul sensibility and into a different dimension. That’s one of the highlights. Another comes straight afterwards, with Becca Stevens’s equally poised but comparatively uncorseted tilt at “The Confession”. At the centre of the whole thing, in structural and emotional terms, is Rickie Lee Jones: out of all the singers in the project, she is the one who most resembles Nyro in style and delivery (and, as she has often said, is most influenced by her), making her perfectly suited to bring out the tragedy of “Been on a Train”, helped by a most imaginative arrangement for the string quartet. Her presence makes me wish Childs had also called upon Mary Margaret O’Hara, the other singer I think of as an heir to Nyro’s legacy. But once you get the measure of what Childs is up to, there isn’t a bad track here. What he gives us is a beautifully conceived and meticulously executed song cycle, a fitting tribute to one of the most original and gifted artists of our time. Yes, it’s polished thing, far more polished than Nyro’s own records ever were, but that polish is no superficial gloss: it’s the patina of a profound respect. And beneath it beats the heart of an extraordinary woman. 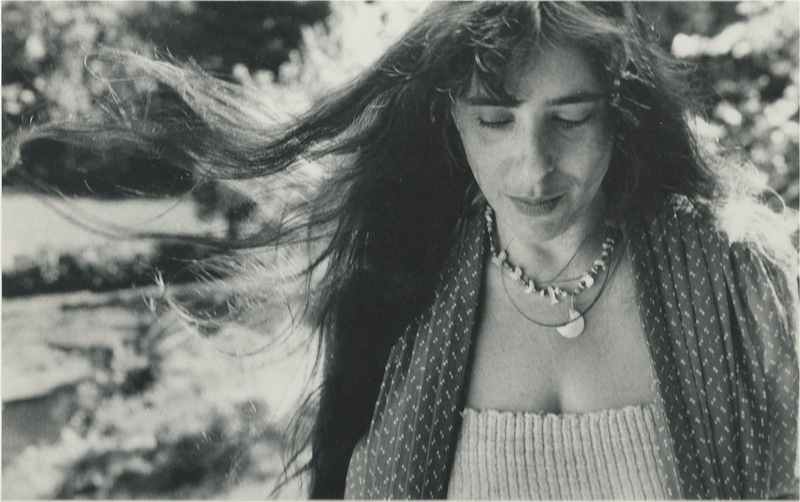 * The photograph of Laura Nyro comes from the cover of her 1984 album Mother’s Spiritual and was taken by Irene Young. The ticket for the 1971 BBC TV concert is mine. Anyone who loves Nyro’s music and hasn’t already read Michele Kort’s excellent biography — Soul Picnic: The Music and Passion of Laura Nyro, published by Thomas Dunne Books in the US in 2002 — should do so. And here, for free, is a link to an interesting piece by an academic, Patricia S. Rudden, from a 2006 edition of the newsletter of the Emily Dickinson Society (you’ll need to scroll down to the third page). Clips of Nyro on YouTube tend to get taken down quickly, but here’s a beauty: her performance of “Poverty Train” at the Monterey Pop Festival in 1967, giving the lie (despite a lame band of session men) to the myth that it was a total disaster. And here’s a real oddity from 1969.
thanks Richard for the recommendation here and for long term support for an artist whose public profile in no way matches the enormous depth of her talent. I was at the union Chapel gig and remember it with great affection. I also loved the wonderfully tender Gonna Take A miracle and the later live recitals caught on record. Very good to see her legacy being cherished. regards Thom. Thanks, Colin. I’ll look into that. Colin/Richard, I’ve now had a chance to view the compilation video held in the British Film Institute. What we get is precisely 17 seconds of Laura singing ‘Stoney End’, which was the encore at the BBC concert. It’s in extreme close-up on her face. She looks great and sounds great, as you’d expect, but I went away with a deep sense of frustration. If they preserved the footage for two years – the concert was in 1971, the series compilation assembled in 1973 – why oh why did the BBC junk it, or record over it afterwards, as seems to have happened? I was at the Union Chapel show in 1994. I never thought I’d see her perform. At the time some artists strayed to Newcastle but the ones you really, really wanted to see rarely did. So, I made the trip to London. I had to. It was to be a weekend of music heaven all planned out. Laura on the Friday; Van Dyke Parks with a string octet on the Saturday (again at Union Chapel; then to top it off Randy Newman on the Sunday. Again, Van Dyke and Randy we’re going to be first times for me. Everything just coincided…but VDP cancelled and we found out at the venue, and smiles were wiped away. 2 out 3…there you go. Laura was just wonderful and I’ve a couple of live albums with Laura and a line up of girl singers (neither from Union Chapel) that do her great credit as songwriter and interpreter of those songs you mention. The biography you mention is terrific but an early death claimed her, so her story was cut short. I’ll be buying the Billy Child’s album for sure. Thanks, Richard. Richard, Hell – you really do stir up the memories. 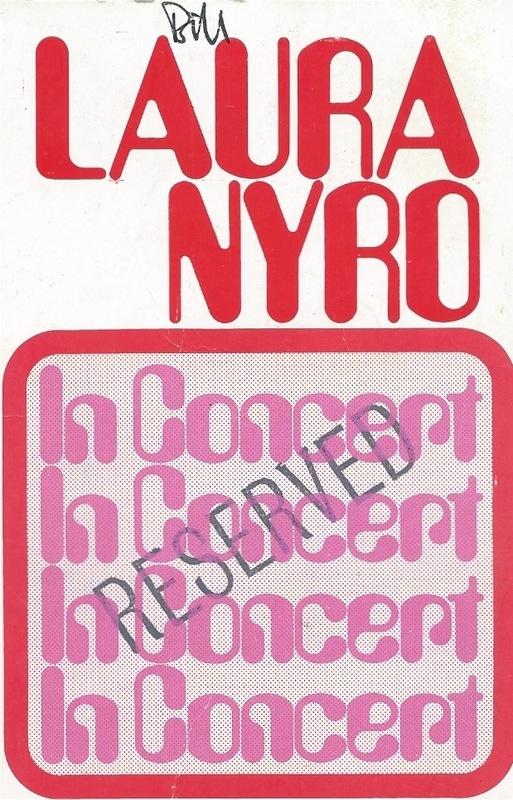 I was at the Festival Hall Laura Niro gig – back then…. but that world was always an aside to my sort of hard-core jazz world…. seemingly unstructured programming – the Luminato stage folk were really together with their running of the show – so when I wasn’t conducting, I was one of the audience, with a really good seat. Martha Wainwright – Jeez! she was dynamic – singing songs she didn’t know (reading the words ) but absolutely stunning. and then – Jeez! – Mary Margaret O’Hara – oh dear . I was so taken by her most personal quirky way – she was so fragile (Daniel really looked after her on stage – with encouragement) – but her singing was so very very touching and alluring. want to hear especially these three ladies again……and was so moved by your blog to have to write this to you. can’t figure out how to attach pics here – will send by email. I am often asked that question – for the life of me I don’t know why it’s never been released on cd. Several attempts have been made to get them (Universal) to release it – Provocateur Records did get permission to licence it but only for one year – so said No. The year we (Gary Burton and I) made that album, we also made Seven Songs For Quartet And Chamber Orchestra – for ECM. That too lay unreleased until Feb this year..
Maybe I’ll have another go at Universal. For a while I contemplated re-recording it with NDR in Hamburg – but it would naturally not be the same thing..
Mary Margaret’s two gigs in London 25 years ago — at the Duke of York’s and the Dominion — were among the most memorable I’ve ever seen. Such exquisite fragility, such musicality… I’ll write about her strange career at greater length soon. Please don’t wait too long. I saw the Royal Festival Hall concert. The sleeve notes of the LP I’ve got (‘Christmas and the Beads of Sweat’) include a credit for Alice Coltrane on harp. And as they say now, how cool is that? Great to read this and many thanks for consistently pressing the case for Laura Nyro’s extraordinary music and talent over the years. I was abroad when she did her Union Chapel gig and remember cursing abut missing out as I read the review! While it is difficult to imagine any other versions of some of her songs, such as her extraordinary vocals on a track like Been on A Train, I will definitely give this compilation a listen, and probably buy a copy for my eldest daughter…. called Laura, born in 1974, and now a full time musician! Yep, ‘Eli’ and ‘Tendaberry are indeed masterpiece albums, but I would include their immediate successor, ‘Christmas and the Beads of Sweat’ in the same category; ‘When I Was A Freeport and You Were The Main Drag’ – just fabulous. I was also at the RFH gig all those years ago. I wish I could remember more about it. I had completely forgotten that Jackson Browne opened the show. But I do remember that Laura Nyro was everything that I had hoped for. Does anyone have her setlist? Laura Nyro was a gem. Thanks for the heads up on MAP TO THE TREASURE, I plan on checking it out. Many thanks Richard for the heads-up on Map to the Treasure It’s as good as you suggest & just about my favourite release of the year to date. A great Christmas present idea for anyone with consummate good taste. Re-Post: I was also at the RFH gig all those years ago. I wish I could remember more about it. I had completely forgotten that Jackson Browne opened the show. But I do remember that Laura Nyro was magical, mesmerising and everything that I had hoped for. Does anyone have her setlist and is there any film of the concert? I’ve just come across this page, years late as usual with me. I saw Laura at the RFH and later at the Union Hall. I’d originally come across her via the 5th Dimension’s hit version of Wedding Bell Blues, my girlfriend, later my wife, said it was her song. I checked it out and found that Laura had written other hits. I remember the BBC concert, a tragedy that it has been lost. I do have a video of an American Bandstand with her singing Wedding Bell Blues, sure she’s wearing a hat! My first love in music is soul, mainly 60s and 70s, and I’ve always felt Laura had great soul in her voice. There is a big soul influence in many of her songs on the early albums. So much more I could say about this wonderful singer but have no wish to bore anyone. Suffice to say it was a tragedy that she died so young, but she has not been forgotten by those who loved her music.